Quality in translation is the single most important aspect to the success of our global economy today. Without top quality translations into all languages, the world couldn’t communicate as fluently and instantaneously as, we are now, all, accustomed. Imagine big brand global companies without successful multilingual platforms and advertising? We would never see incredible growth of international trade without this vital tool. Let’s look at this with Polish translation. With over 50 million people worldwide being native Polish speakers from Poland to America, Brazil, Argentina, the U.K and Ireland to name a few; it’s no wonder that only the highest quality Polish translations are acceptable to businesses across the world. Not only this, but according to the U.S Foreign Service Institute, Polish is one of the most complex and difficult to learn languages for non native speakers, gaining a rank of 4 in a possible 5 categories of difficulty which means that realistically only native speaking Polish translators who are living in country can offer a guarantee to the standards demanded by businesses in today’s competitive market. The translation industry has long recognised the importance of good quality and one of the most recognisable quality standards that Aploq Translations works towards are the ISO 9001:2009 standards as well as ISO 17100 standards. These offer a standardized measurement for what constitutes good practices throughout the translation industry. By ensuring all linguists, while highly proficient in multiple languages, always translate into their native tongue, the highest standard finished translation is assured. A provision for in-depth review and editing processes offers peace of mind that every project benefits from the expertise of at least two professional linguists, as well as project managers to guarantee translations of the highest standards time after time. Machine translation, the use of CAT tools such as terminology databases and translation memories enhance the efficiency of translation provision, while mandatory reviews by qualified translators dramatically increase the quality assured for each project. 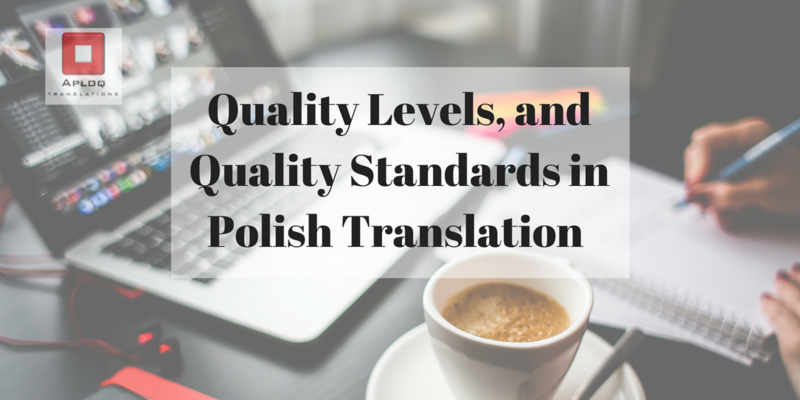 For to good quality control standards, true quality levels in translation can’t be achieved by focusing on the translation work alone, Aploq is proud of our highly skilled in house team of proofreaders; each Polish linguists with education and experience in Polish language editing. They play a vital role in ensuring the quality of each translation. True teamwork doesn’t just involve exceptional linguists, everything from project management, workflow, speed of service as well as data protection each play a critical role in achieving success in translation and as a translation service overall. Real quality translation doesn’t just stem from implementing the correct processes, but through the continuous cultivation of a great team by providing feedback as well as the management skills to develop each staff member to their full potential. Good customer service can never be underestimated, listening to clients needs and having the flexibility to provide professional, innovate and reliable services is, needless to say, invaluable to a lasting business relationship. Likewise, with privacy on everyone’s mind after the implementation of GDPR, how people’s sensitive data is handled has never been more crucial when looking for a high caliber, trusted translation provision. This is definitely a difficult question to answer, being that when you’re in need of translation services you’re rarely in a position to do quality control yourself. Quality standards and rigorous testings can do a lot to assuage any possible doubt. However, the quality of any translation can only truly be measured in how successfully the source message is conveyed into the target language in order to properly communicate its full meaning to a new audience. At Aploq Translations, we pride ourselves in accomplishing this goal with each and every translation.